Looking forward to Wednesday, ACORN photoshoot. I will be recreating my visual comp at this amazing oceanfront location here in Maine. "LIVE IT" is the positioning statement and the concept for the entire catalog. I can't wait to show you the layered details, surface patterns (Acorn's not mine:) and amazing photography + lots of color that has gone into this SPRING 2012 catalog. Once finished I want to post about the amazing stylist, and creative team that has been so incredible to work with! I have been also playing with a new hand screened tag that will now be on all my work. I have been meaning to get on this for a year but since we have one stitch on every pillow (back flap) wanted to make sure the hang tag that I designed told a good story--and made a impact...just didn't know what I really wanted until now. I have also been dreaming up a new website design. I hope to get on top of that and launch FALL/WINTER 2011/2012. I would like it to be more about my work and my process, with great photography and maybe a blurp about myself that I haven't done before. My portfolio is very outdated online at the moment and want to be able to upload new work as I finish easily and have a more refined looking blog set up. Country Living will be shooting her in July/August...they have not given me an exact date but been working on new projects and dreaming up news ones. Hopefully we can button it all up before they come. But honestly, it is just an amazing crazy thing that they are coming to Gorham, Maine. They want to shoot our home before / after style + a little write up of my textile design work. My friend PR chick, Hannah Gregory will be here shooting the whole thing--ha ha. Shooting what they are shooting and just be here to capture the day. Should be fun to see how they transform the place into something that is truly CL worthy. (styling and photography is an amazing thing). Katie Brown's shoot went well and my pillows will be in Better Homes & Gardens in September in a outdoor spread I hope. 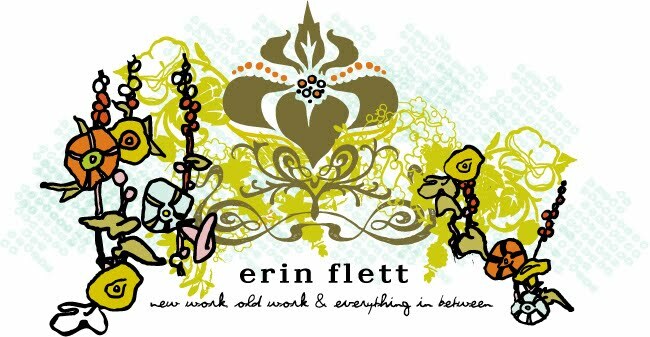 Sounds like from the personal assistant that dropped off all the pillows I sent (all 27 of them) mentioned the outdoor seating / lounge area was the Erin Flett pillow focus. So we will see what actual makes the cut. Very excited. AND Katie Brown herself picked out a MR. NUT + COFFEE RINGS for herself and Stacy, the stylist took home ARIA. I had a few great calls this week--one from a outdoor fabric manufacturer, this time from the US...possible collaboration in our future...a few business calls for some cool botanical soap packaging---and gearing up to start the Portland Maine rebranding process. And also a lead with a Japanese company that produces all sorts of cool modern projects might be purchasing some new prints. A lot of fun things in the works and just really trying to focus on some new prints for my pillow line...still working on yardage. Burning world...Conceptually my focus on the new line will be focused on organic natural shapes and patterns, smaller scale repeats and more modern approach in aesthetic. The round pillow graphic is more in line with the vision I have. Almost a collage of elements with a modern edge. Inspired by mid century modern elements but with a hand drawn aesthetic along with other unexpected organic / collaged elements. I woke up thinking as I often do...and felt the need to share the past week. Yesterday someone hit my Honda Pilot while parked in the old port--long story is that Mas and I ended up in the PD for more then an hour making a police report since an amazing guy left me a note of every detail of who hit me--make, plate number etc. I felt completely overwhelmed at this man's kindness. Yes my right side of my pilot is creamed---but here was this guy who took the time to help me. Amazing. But because I was at the PD a good friend invited Mas and I out for a drink and well, ironically ended up at Havana South. We ended up seeing some friends and since a design conference that was happening in town (which I am sick I didn't know about or if I did, some how got missed in my email box) ended up sitting down over drinks with the Editor In Chief at PRINT magazine. Okay, so this guy is amazing. After getting PRINT mag since I was a graduate from Kansas University ...it was surreal. Amazing. I showed him my work and talked about my journey a bit..and really found his own personal story so inspiring. Needless to say a terrible hit and run accident that day, led me to this amazing evening with a design icon. (thank you Mandy). So I am understanding the way of the world, universe a little more each day---so the other insane thing that happened this week--is that FULL SWING (the supplier of my bark cloth) is no longer selling it due to the increase cost of cotton and the high minimums. I totally freaked out knowing that this cloth that I have been so emotional tied to may not be available to me. (If you don't know the story about the cloth for me is that my mom has collected it my whole life--and it was a personal great find at yard sales and antique thrift shops.) I have the greatest memories collecting this cloth with my mom my entire growing up. This cloth is ONLY available through this one mill as far as I know. After some back and forth he sent me the manufacture of the cloth since he could not supply it. The owner of the mill, the weaver of this amazing bark cloth said that in over 27 years no one has ever just given that info out. Just doesn't happen. I feel so blessed that Fred at FULL SWING felt I should have it, that I needed it (which I did desperately) but also, that he believed in what I am doing and has now given me the info to keep going. This all boils down to how people rally around you and push you even if sometimes you fall or feel like what ever it is--will not happen. That authentic self plays this roll that if you are truly who you are--and ask nothing more then just to be heard--absorbed-things work out. Seems so easy..so obvious. But I have been around people in my life that are negative or just make bad decisions but decisions based out of fear or sadness or what ever. But I wish I could bottle up this passion sometimes and give it away and tell people that is it...that is all you need, the rest just follows. I am no where in my career where I can say I am content, or even close to being heard truly as a designer. I feel this is the start of it all. And since I have great momentum this past year on so many fronts..it's confirmation in my soul that I am on the right path to just be able to do what I love--which is all anyone wants right? This post has no pretty pics or work---just me. And I am so not alone in my quest for greatness. It's just been an amazing week and I wanted to thank each new opportunity, gift and good deed that has come my way and hope I can return each and every blessing.